In January, everyone tends to bleed purple, green and gold. With the much-anticipated beginning of Mardi Gras season comes the arrival of those delicious, addicting, circular pastries known as king cakes – and with king cakes come a little friendly competition. Who will be the king (or queen!) of king cakes in Shreveport-Bossier? 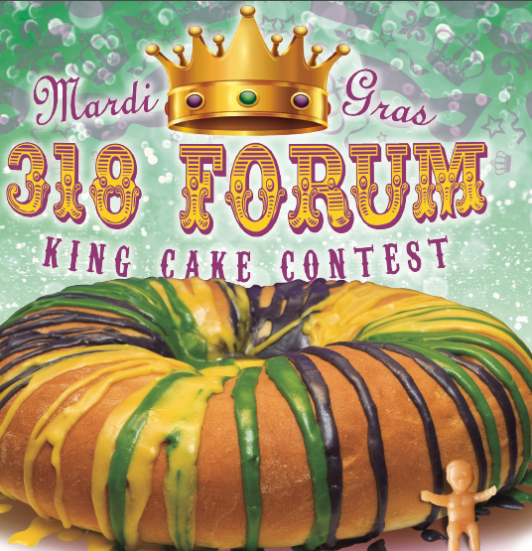 Vote online at www.318forum.com for the “Great 318 King Cake People’s Choice Award.” The people’s choice winner will receive a trophy, bragging rights and $150 donated to their favorite charitable organization. Go to www.318forum.com and choose your favorite. King cake is said to have originated in old-world France and Spain and is known for its association with the historically Catholic celebration Epiphany, or Twelfth Night, which marks the arrival of the three wise men in Bethlehem who delivered gifts to baby Jesus. In America, king cakes can be purchased in early January up until Fat Tuesday and the start of Lent. They’re made of a cakey-bread dough, twisted into rings – to imitate a king’s crown – and decorated with a variety of flavored icing and sprinkles. Some cakes are filled with cream or fruit. 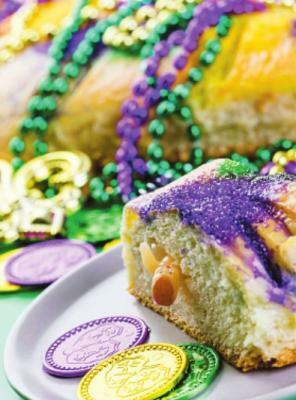 The best part of a king cake – besides their delectable taste – is the secret inside. Every king cake contains a tiny trinket, such a plastic baby, and whoever finds the trinket in their slice of cake gets to be “king” for a day. Another common tradition is that whoever finds the baby must host the next year’s celebration. (Or at least, provide the next cake!) King cakes are celebrated around the world. In France, galette des rois which translates literally as “cake of kings,” contains frangipane almond cream. They tend to top their treat with a paper crown and hide a bean inside. Bulgaria’s banitsa consists of sheets of phyllo dough wrapped around soft cheese and contains written fortunes. The vasilopita in Greece and Cyprus closely resembles the French galette and usually has a coin baked into it. King cakes are certainly a big deal in Shreveport-Bossier, and the selections are plentiful. Most are typically decorated in purple, green and gold – which represent justice, faith and power – and are currently up for grabs. Locals will find themselves with only one tough dilemma: Who makes the best one? Wanja Majstorovic, manager of Julie Anne’s, believes they have the best king cake in the entire city. “We bake ours with patience, care, effort and a very special dough,” Majstorovic said. Majstorovic loves her job. “The pleasant aromas and the atmosphere of the bakery are my favorite part of my day,” Majstorovic said. “Plus, working around all this delicious food isn’t too bad either!” Julie Anne’s Bakery & Café offers 27 different flavors of king cake – providing something for every palette. “Our four most popular cakes are cinnamon-sugar and cream cheese, pralines and cream cheese, strawberries and cream cheese, and plain cream cheese,” Majstorovic said. Regular sizes that serve five to six people are priced from $19.99-$25.99. Mediums go for $43.99-$52.99, and larges are $64.99-$72.99. Regular and medium sizes can also be shipped. Julie Anne’s Bakery & Café is open from 6:30 a.m. to 6 p.m and is located at 825 Kings Hwy. For more information visit www.julieannesbakery.com or find them on Facebook. The Wooden Spoon offers the following flavors: cream cheese, cream cheese and pralines, strawberry cream cheese, blueberry cream cheese, apple cream cheese and traditional praline. Small cakes are $10.95, while large cakes that feed 12 are $20.95. “Most of our king cakes are made to order, so we encourage customers to place an order and get a fresh one,” Judge said. The Wooden Spoon, known for their cookie baskets, are also offering decorated Mardi Gras baskets, containing an assortment of cookies, muffins and brownies. Baskets start at $33.75. They’re also offering another holiday favorite – king cake cupcakes. “They’re purple velvet with praline filling and decorated with cream cheese frosting and sprinkles,” Judge said. The Wooden Spoon is located at 4350 Viking Drive in Bossier City and is open Monday-Friday from 8:30 a.m. to 5 p.m. Visit them at www.woodenspoononline.com. Gill McElroy, owner of Southern Maid Donuts, makes his king cakes fresh daily – and they hold a special advantage. “Ours are made of the same dough as our famous Southern Maid donuts,” McElroy said, “And you know – everyone loves a Southern Maid donut!” Southern Maid Donuts offers king cakes in one size fits all, with one price to fit all – $21.95. These cakes feed 15 to 20 people, and flavors include cream cheese, Bavarian cream, raspberry, chocolate and strawberry cream cheese. Southern Maid Donuts is open Monday-Friday from 6 a.m. to 7 p.m. and Saturday and Sunday from 7 a.m. to 7 p.m. To order a cake, call 318-524- 3900 or go online to arrange to ship at www.southernmaidkingcakes.com. 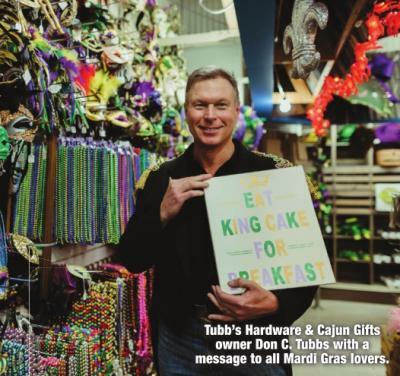 Don C. Tubbs, the owner/operator of Tubbs Hardware & Cajun Gifts, knows king cakes like the back of his hand. Tubbs king cakes are one size that feeds 16 adults and sells for $29.95. Flavors include traditional cinnamon, extreme cream cheese, strawberry cream cheese and blueberry cream cheese – with more flavors coming soon. Tubbs Hardware & Cajun Gifts is open from 7:30 a.m. to 6 p.m. Monday- Saturday and is located at 615 Benton Road, Bossier City. Find them on Facebook or call 318-746-0311 for orders. Sarah and Preston Lowder, owners and bakers of Lowder Baking Company, are certainly contenders in the competition. Lowder cakes are $30 each. “Right now, we’re offering traditional brown sugar and cinnamon, and cream cheese,” Lowder said. Their regular-sized king cakes serve 12-15 people, while their mini king cakes serve two to four. Lowder provides one purple, green or gold baby for the customer to hide inside the cake. 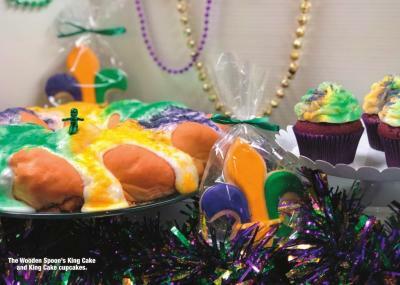 “King cakes are so much more than just a delicious dessert – it’s a way of sharing our rich culture and traditions of Louisiana,” Lowder said. “Mardi Gras is such a happy time of year. 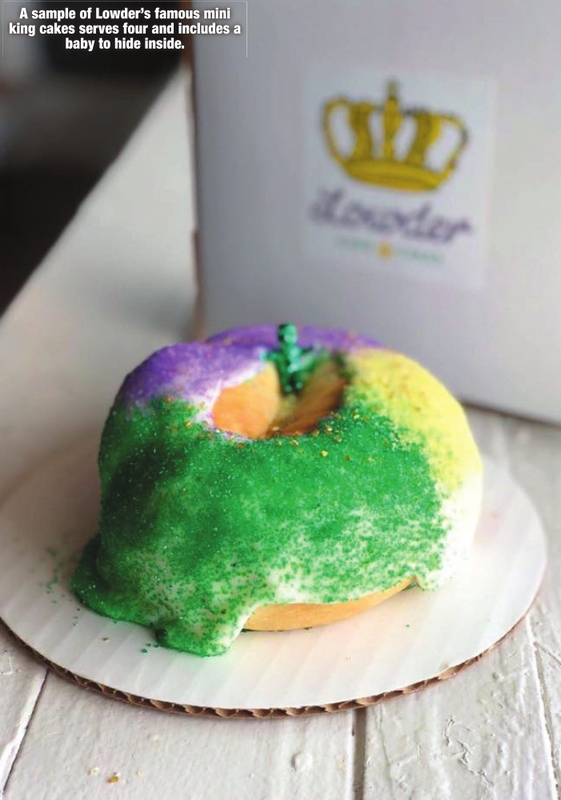 We are so proud to be a small part of the magic during the Mardi Gras season!” Lowder Baking Company is located at 4019 Fern Ave., Suite 500 in Shreveport. Visit them at www.lowderbakingcompany.com. Mardi Gras hours are 7 a.m. to 5 p.m. or until sold out. Lisa Tike, co-owner of Lilah’s Bakery, is a king cake connoisseur, offering 28 different flavors and four sizes of king cakes. “We bake them fresh all day, every day during Mardi Gras season,” Tike said. Size options include mini, medium, large and extra-large. Prices start $17.99 for the medium size and goes up from there depending on size and filling preferences. Lilah’s also offers a flavor of the week every week of the season. “We will even make gluten-free king cakes by request,” Tike said. “I always like to think that finding the baby in the king cake gives you good luck – and when you buy the king cake from us, you are doubly lucky!” Tike said. Open from 8 a.m. to 6 p.m. Monday- Saturday and 11 a.m. to 4 p.m. on Sundays, Lilah’s is located at 1718 Centenary Blvd. in Shreveport. Find them on Facebook for more information or visit www.lilahsdeli.com. To vote for your favorite king cake, go HERE and choose your 318 Great King Cake winner! Taking the Scary Out of College Prep!